Khalil Mamoon Pipes There are 4 products. Khalil Mamoon shisha pipes is a world famous Egyptian brand of hand crafted highest quality hookah pipes. 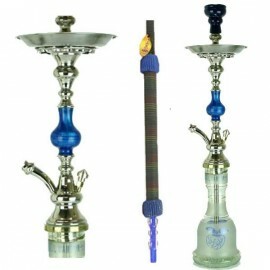 We have the latest 2011 range of highest quality traditional KM shisha pipes now in stock. You will not find a better range of Khalil Mamoon pipes online at such good prices. Khalil Mamoon pipes are renowned in Egypt for producing some of the best hand-made Egyptian shisha pipes avaiable to buy. A lot of attention to detail is made in producing the unique designed stems using hand tools and the glass vases that are hand painted so each one is a little bit different. Khalil Mamoon Anubis Tri Metal 31"